The tradition is taken from the Bible, particularly John 8: 56-58. In this passage, Jesus is asked how he could have seen Abraham if he hadn’t yet reached fifty. He surprised the inquisitive Jews by saying, “Very truly I tell you, before Abraham was born, I am”. Sarah was Abraham’s wife, hence used for females turning 50. The Dutch have taken this Bible passage and made it into a longstanding tradition. When someone turns 50 it is a celebration of their life and all they have achieved. 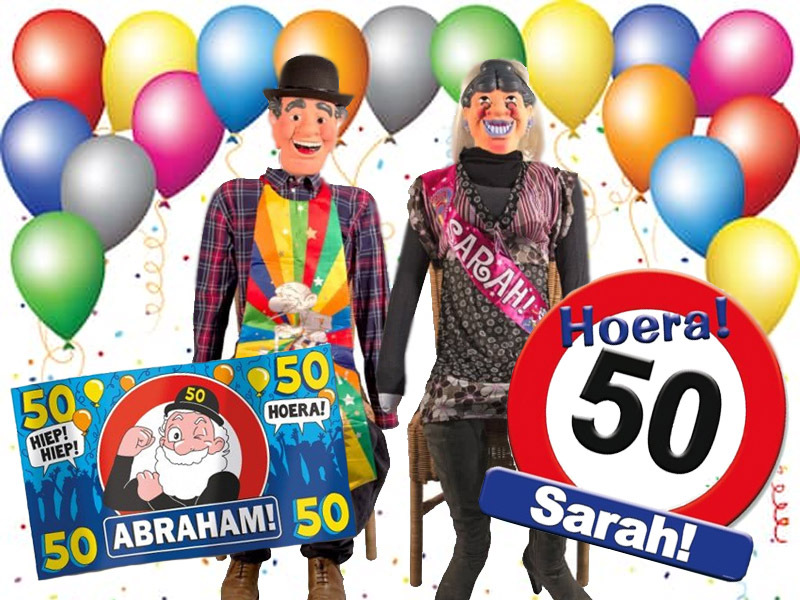 One of the best known (and visible) part of the celebrations is the placing of a doll or inflatable of either Abraham or Sarah in the front garden of the person who is turning 50. It will often be accompanied with a sign just to make it 100% clear that it is someone’s 50th Birthday. It is also common to bake a cake, bread or cookies in the shape of a male or female figure. You can also carry on the tradition for each decade of a person’s life after 50, although not nearly as popular is Abraham and Sarah.